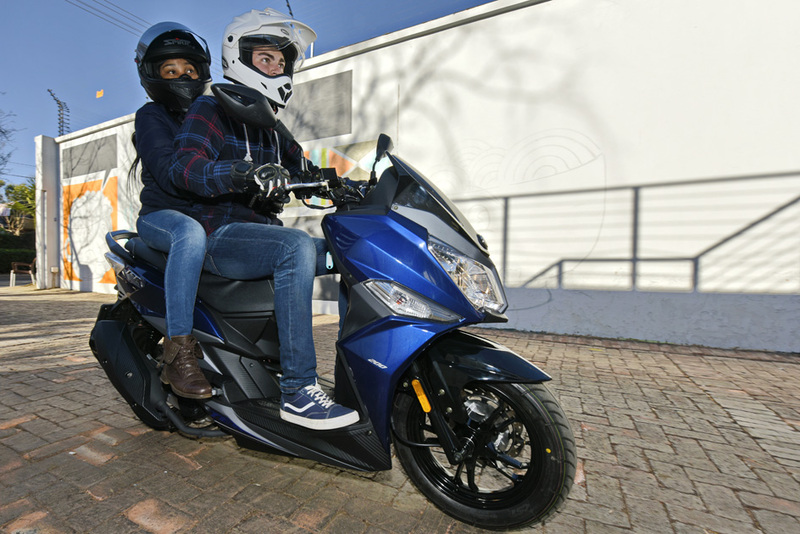 Designed to get the best out of city traffic, the Jet 14 is a high-wheeled scooter that stands out for its aggressive yet elegant design. It is ideal for those looking for practical, every day transport, and who want to stand out from the crowd. Just like its SYM siblings, it always seemed to be the centre of attention. 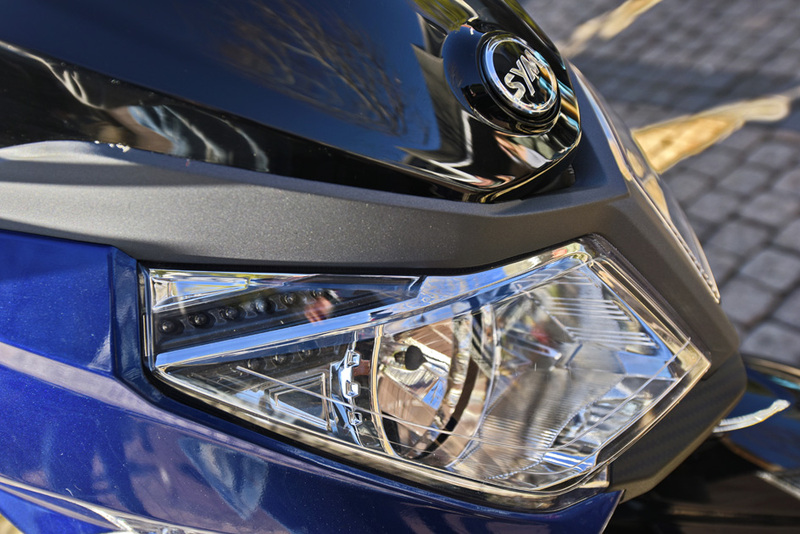 The Jet 14 has striking double LED head lights, and an attractive rear light with “3D-design”. 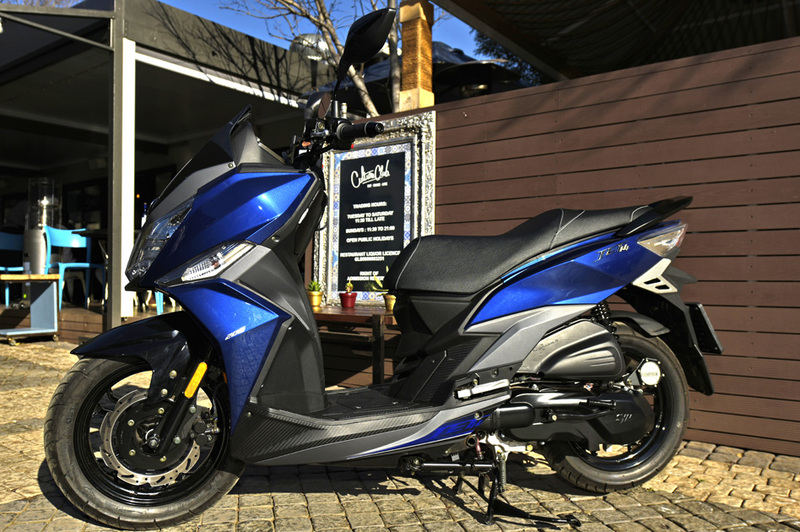 Check the detail in the styling, and you will notice the imitation carbon fibre on the exhaust heat shield, and other body panels, giving the SYM Jet 14 a really sporty look. The telescopic forks, combined with the twin rear shock absorbers, give a firm, yet comfortable ride, even when negotiating less than perfect surfaces. Thanks to the 14 inch rims, this scooter handles the tightest, and most congested streets, with ease. The mirrors are excellent, easy to position, and provide good rear vision, eliminating blind spots. 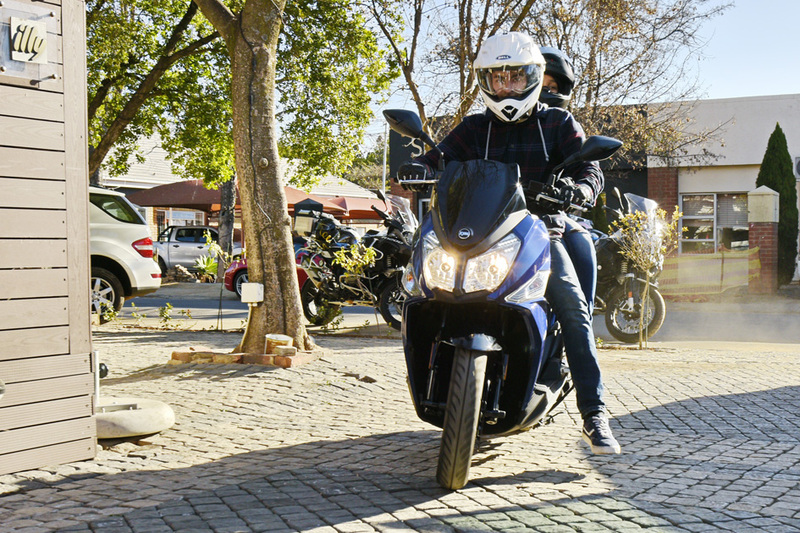 Lightweight and particularly manoeuvrable, the Jet 14 shows its muscle with its air-cooled 168.9 cc single-cylinder 4-stroke engine. 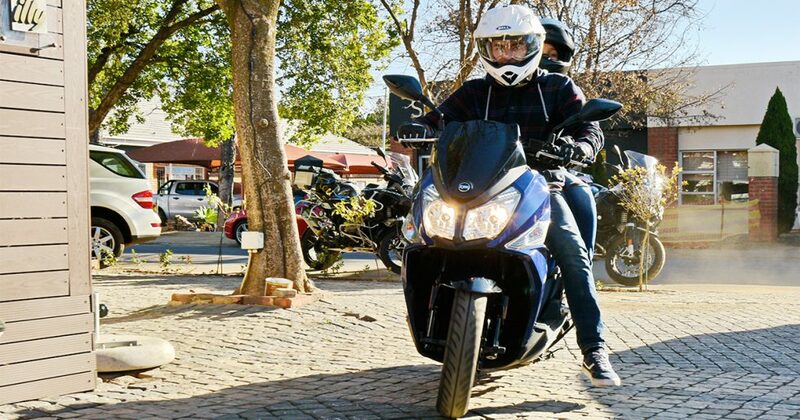 A twist of the throttle easily gets rid of chaotic city traffic. Vibrations are minimal, and then only at Idle. Once she’s rolling, all is super smooth. 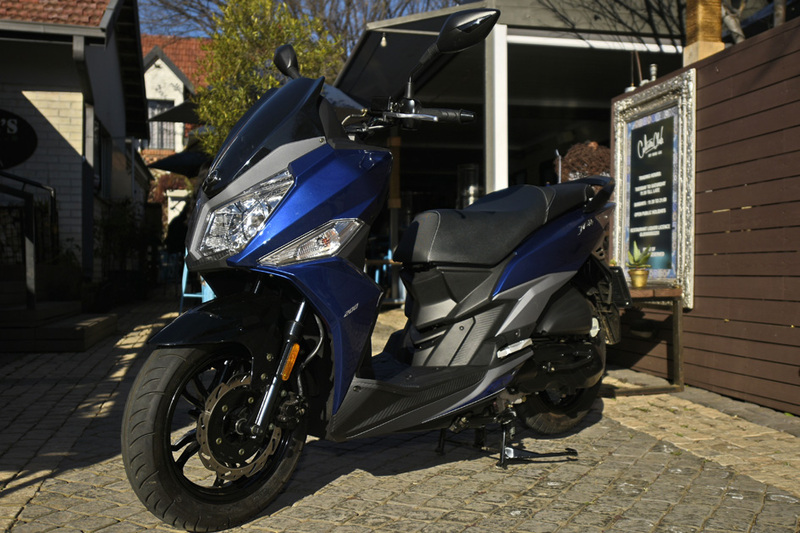 The SYM Jet 14 does not only ride well, but it stops well, with both front and rear hydraulic powered disc brakes. The rear brake in particular, is phenomenal. It could be due to SYM using a braided hose, instead of running the conventional brake lines found on most scooters. A helmet can be stored in the compartment under the saddle. There is also a compartment located directly in front of the seat, with a lock, allowing you to safely store your Smart phone or small luggage. Underneath the seat, SYM has cleverly placed an engine lock switch. (kill switch) Leaving your scooter parked, has never been safer. I did have a clumsy moment when taking my helmet out of the storage compartment. I accidentally flicked the kill switch, and after several minutes of trying to start the scooter, I figured it out. The wide, well shaped saddle, makes it easy to transport a passenger, as well as being very comfortable on long journeys. There is also a bag hook in front of the rider for your Woolies shopping. The Jet 14’s clocks layout is simple to read, with the analogue fuel gauge on the left, analogue speedometer in the centre, and on the right you find the digital rev counter, trip meter and a clock displaying the time. 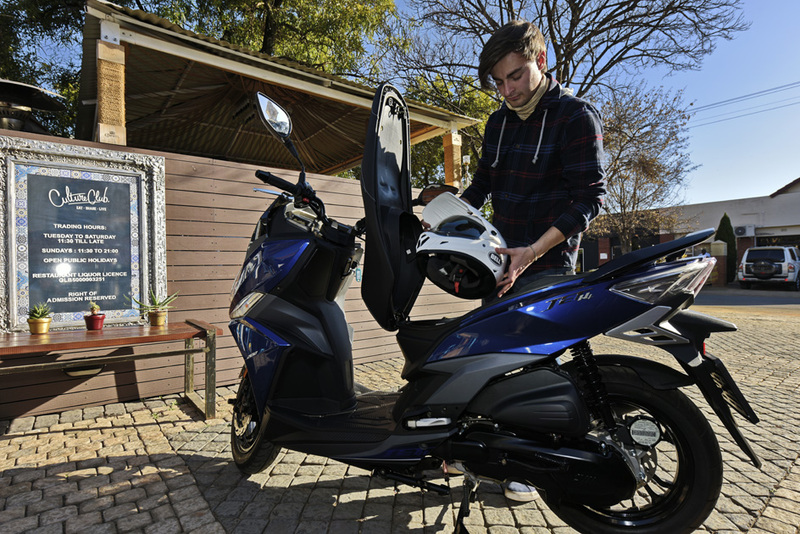 As for fuel economy, the SYM Jet 14 does a great job. With a 7.5L fuel tank, I managed to get 213.2km before running out of fuel. [28k/l] Small capacity Scooters aren’t meant for highway use, yet I spent roughly 200km on the highway and realised the SYM Jet 14 can do it, albeit at its own pace. The screen on the Jet 14 works well in town, but on the open roads it is a bit lacking. With a top speed of 110km/h, and a rev limit of 10 000rpm, the Jet 14 sits comfortably at 90km/h,[ at 7 000rpm] and could do 100km/h all day long. Early morning peak hour traffic seldom does over 80km/h, so highway commuting, whilst not ideal, is possible. Practically speaking the little SYM is a revelation. Priced at under R23000, you get incredible bang for your buck. Go and price bicycles, then you will realize what a bargain this classy SYM is. This is a real freedom machine. 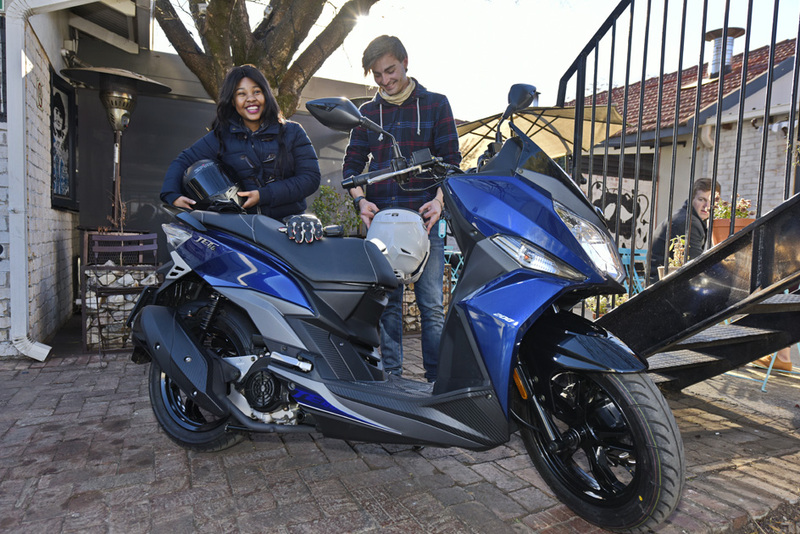 Traffic snarl ups, fuel prices, and general twist and go ease of use, make the Jet 14 the weapon of choice for the savvy city dweller. I find myself questioning why I don’t have one for city use to save my big bikes. It will literally pay for itself with fuel, tyre and service savings on the big chaps. Wise up South Africa! Take your cue from the Europeans and join the SYM freedom revolution! Jet 14, you little revolutionary, Che’ Guevara would be proud of you!